No, if you have healthy teeth and gums, Dr. Colalillo can provide adult orthodontics in his Collingswood office to correct many dental alignment issues. Whether you have had braces before and your teeth have drifted, or never had the opportunity to get those protruding front teeth corrected, or you have shied away from braces because of their obvious appearance, Dr. Colalillo can help. Plus, you needn’t feel odd or alone. 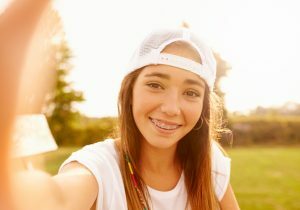 The American Association of Orthodontists says that the number of adults seeking treatment with some type of braces has increased by about 25 percent over the past thirty years. It seems that adults just want nicer, healthier smiles and really like the many types of braces available these days. The first step toward your new smile is an orthodontic consultation with Dr. Colalillo. He will examine your teeth and gums to ensure they are healthy and fix any problems with decay or deteriorating restorations before recommending a course of treatment with braces. Also, he’ll take digital x-rays, oral impressions and other kinds of modern imaging to formulate your treatment plan in the wisest way possible. Metal brackets, bands and wires gradually exert pressure on crooked teeth to move them into more favorable positions. A must for complex alignment issues, conventional braces are a tried and true method for achieving a healthy smile. They pose more intricate oral hygiene routines, however, and limit food choices that are overly hard and fibrous. Some teens and adults dislike their obvious appearance and more lengthy treatment times. While operating on the same principles as traditional braces, the Clarity system uses clear and tooth-colored brackets and wires to move teeth. Adults like their more subtle appearance. These biocompatible clear aligners resemble teeth whitening trays. They are customized according to your oral impressions and Dr. Colalillo’s treatment plan, giving you a new smile in far less time than metal braces. Plus, they are very discreet, removable for meals and oral hygiene, and comfortable. The aligner pairs correct a wide range of smile problems without complex adjustments. Don’t put off braces any longer. With so many options currently available, there’s no need to wait on your best smile. 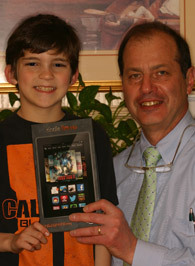 Why not contact Alex Colalillo Orthodontics today for a one-on-one evaluation with this experienced orthodontic team?